WARRANTY!!! 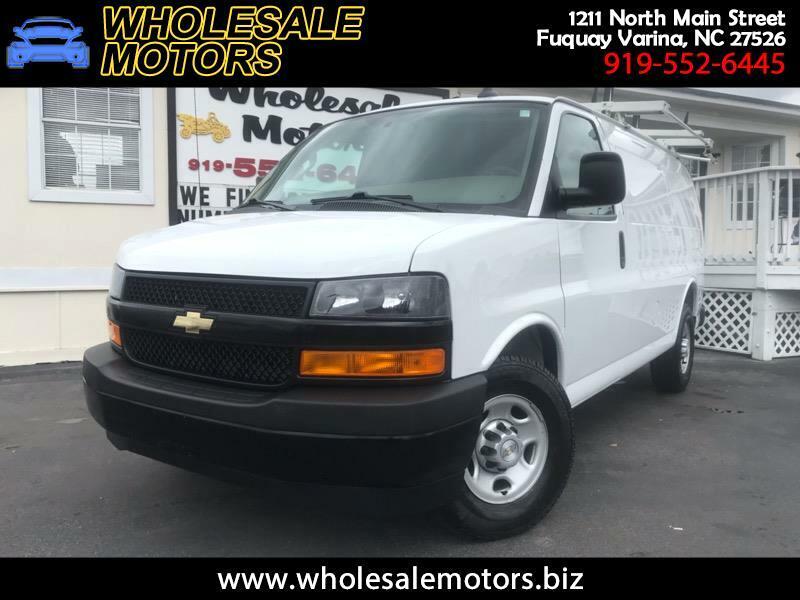 CLEAN CARFAX/ 2018 CHEVY EXPRESS 2500 CARGO VAN/ 6.0 LITER 8 CYLINDER ENGINE/ AUTOMATIC TRANSMISSION/ FULLY SERVICED/ 120 POINT INSPECTION/ AM/FM RADIO/ LADDER RACK/ STORAGE BINS/ CRUISE CONTROL/ NEW TIRES/ WE FINANCE!!! $$$ WE FINANCE $$$ EACH VEHICLE HAS BEEN THOROUGHLY CHECKED, INSPECTED, DETAILED & IS READY TO BE SOLD. EVERY VEHICLE WE SELL COMES WITH A FULL VEHICLE HISTORY REPORT (CARFAX). WE GUARANTEE THE BEST CUSTOMER SERVICE AND QUALITY VEHICLES IN THE CAROLINAS. GO TO WWW.RICKHANCOCKPREOWNED.COM OR WHOLESALEMOTORS.BIZ. LOCALLY OWNED AND OPERATED FOR OVER 30 YEARS. NOT RESPONSIBLE FOR ERRORS OR OMISSIONS. PLEASE VERIFY ALL OPTIONS, COLORS, AND PRICING WITH DEALER BEFORE PURCHASE. WE HAVE 2 LOCATIONS (1211 & 1229 NORTH MAIN ST, FUQUAY-VARINA NC 27526) SO PLEASE CHECK WITH A SALES ASSOCIATE. WE LOOK FORWARD TO EARNING YOUR BUSINESS AND SATISFYING YOUR VEHICLE NEEDS. THANK YOU FOR CONSIDERING WHOLESALE MOTORS & RICK HANCOCK PRE-OWNED :) WE DO NOT ACCEPT DEPOSITS OR PLACE HOLDS FOR VEHICLES, FIRST COME FIRST SERVE BASIS!!! Warranty Description: GM FACTORY WARRANTY. Message: Thought you might be interested in this 2018 Chevrolet Express.